The academic support room helps me in my studies. When I first came to Montgomery Blair High School I didnt speak English. I needed to take ESOL classes to learn to read, write and speak English. 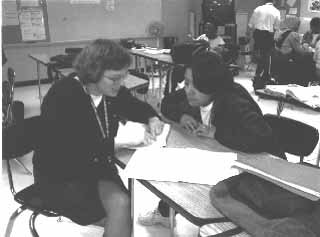 From the beginning I started to go to ESOL academic support for extra help. I remember that lots of ESOL students were there all with the same purpose of getting extra help. Ms. Demers, Mr. Wang, Ms. Montero, Ms. Gonzalez, and Mr. Alcoba were there almost all the time to help to all students with math, English, science, and history. They were there in lunchtime and after school and many other teachers were there sometimes, too. Liwen Ye is one of the ESOL students of Montgomery Blair High School who agrees with my opinion about this program. I think ESOL academic support is very important because they help me with Matter and Energy. I want to say thank you to all the ESOL teachers who help me in the academic support, she said. Sladana Juresic is another ESOL student who has been in the U.S for two years. It is a good idea to come to academic support because they explain well, so that I would know what to do and sometimes they give the answers, she said. "I invite all students of Blair to go to the academic support to get extra help during lunchtimes and after school. Mr. Wang said. Montgomery Blair has extra help for each subject during lunchtime and after school. ESOL academic support tries to help with all subjects in room 151 during lunch and after school. Math academic support is in room 249 during lunchtime and after school Tuesday, Wednesday, and Thursday. Social studies academic support is in room 166 during lunch and after school but not on Friday after school. Science academic support is in room 352 during lunch and after school. Also Mr. Herrmann and Ms. Carlson have a Matter and Energy club that meets on Tuesdays and Thursdays in room 364.